Investing in XJTAG boundary-scan test saved IKOR Group using X-ray inspection to verify connections in places such as beneath BGAs. XJTAG is now integral to IKOR’s test strategy, enabling the company’s engineers to achieve higher testability targets and to encourage customers to apply DFT rigorously in new board designs. 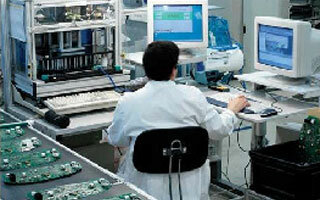 The company’s manufacturing and test activities prioritise speed, efficiency and high product quality for customers. A combination of Automatic Optical Inspection (AOI), In-Circuit Testing (ICT) and functional tests are usually applied, to achieve optimal test coverage for each product type. AOI can identify obvious defects such as missing or incorrectly placed components, or poor solder joints, to avoid forwarding defective boards to ICT and functional testing. However, components in packages such as BGAs, which have hidden I/O pins, cannot be inspected with AOI or tested using a bed-of-nails ICT fixture. To overcome this, IKOR has an X-ray machine allowing defects such as short circuits or open circuits at BGA I/O pins to be identified. However, X-ray equipment is relatively expensive and there can be legal restrictions governing its use. Programming the machine and analysing the images can also be time consuming. IKOR’s engineers needed a faster and easier way to identify these hard-to-find faults. XJTAG provides a graphical view of boundary scan chains, showing I/O pins and connections on a pin-by-pin basis to enhance circuit visualisation and speed-up debugging. Features such as golden board comparison, pin watch, zoom/split screen and single stepping help designers debug boards quickly. Compiling tests is also straightforward, using a high-level programming language to create device-centric tests. These can be stored and re-used to test any future boards containing the same device. Using XJTAG has solved IKOR’s BGA test challenges. In addition, Cristina Jaureguibeitia and the technical centre team are also now using XJTAG to further improve test services. “Boundary scan can test a high percentage of all components and interconnects, and XJTAG has many added features for testing components not connected to the scan chain. There is also an easy to use Design For Test (DFT) feature, which helps us set and achieve high targets for test coverage. We evaluated a number of boundary scan systems, and found XJTAG to be the most user friendly system offering the capabilities we needed at the best price. It has many added features for testing components not connected to the scan chain, and the easy to use Design For Test feature helps us set and achieve high targets for test coverage. We are now encouraging our customers to apply proper DFT principles in their original designs, which enables us to deliver faster turnaround and reduce costs for our customers. XJTAG has become a valuable strategic tool. IKOR Group is an international electronic design and manufacturing organisation, with business units in Spain, Mexico and China. Technical services include design validation, test, and pre-certification for innovative products targeting sectors such as energy management, railway systems, automotive equipment, household appliances and vending equipment.